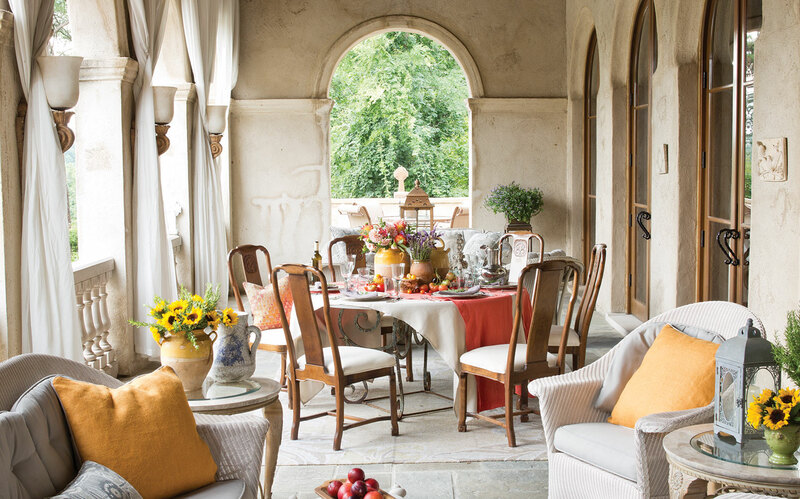 Transport guests to enchanted Italy with a simple summer luncheon on the loggia. 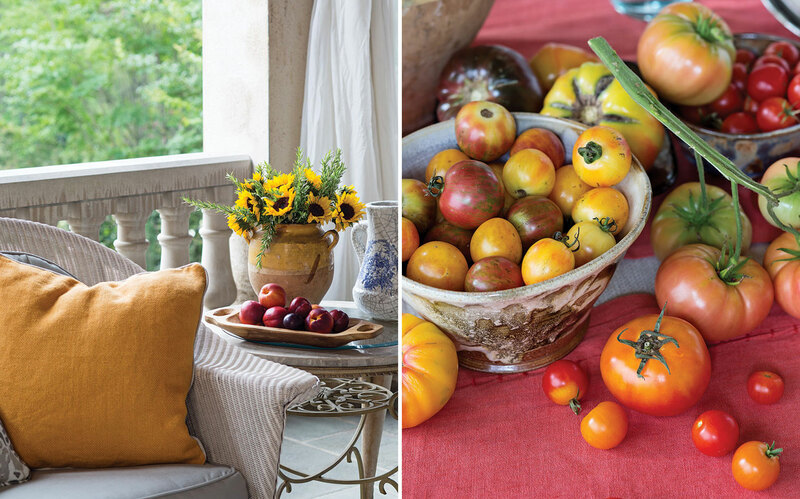 Calling to mind the sun-washed green valleys and ancient hill towns of Tuscany, this outdoor tableau layers honed surfaces, textural linens, and homespun accents with a palette of gentle hues. The subdued scene comes alive with watermelon-pink runners and bouquets of sunflowers and dahlias tucked into earthen vessels, as if freshly picked from the fields. A rosemary sprig laid atop each place setting evokes the magical fragrance of the Italian countryside, while a brilliant assortment of tomatoes spilling over the table whispers of the summertime garden bounty. When it’s time for everyone to gather around the table, continue the mood with a medley of delectable fare that pays homage to the Tuscan tradition of showcasing the flavors of the season. 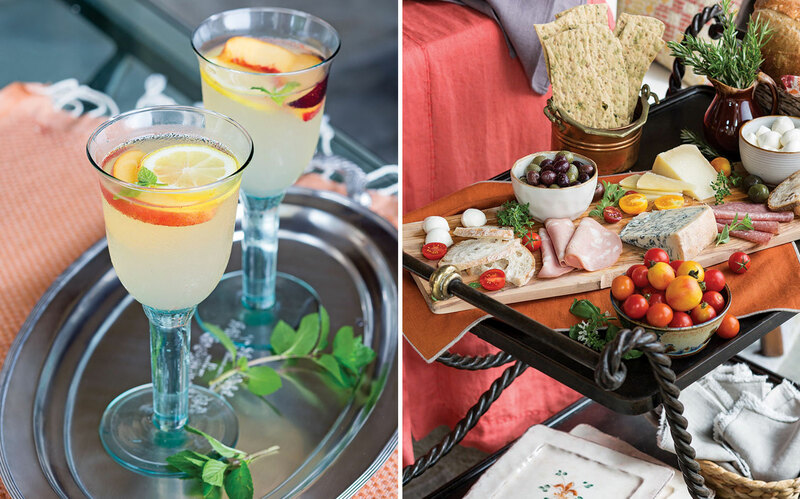 Pour glasses of refreshing limoncello-spiked lemonade to complement juicy melon wedges wrapped in prosciutto as well as an antipasti platter laden with cheeses, salumi, and olives, from which guests can assemble their own tempting platefuls. Bold, rustic farro salad, studded with crisp-tender green beans and ripe cherry tomatoes, pairs beautifully with citrus-kissed grilled snapper and pan-fried eggplant and zucchini. End the repast on a sweet note with gelato inspired by the flavors of cannoli, a fresh twist on a beloved Italian classic. Click through below to get the recipes.